PKS cross conveyor for planing machine is a device used to automate the process of feeding the elements for the planing machine in the technological process. The device provides continuity of feeding the elements forehead on the forehead. 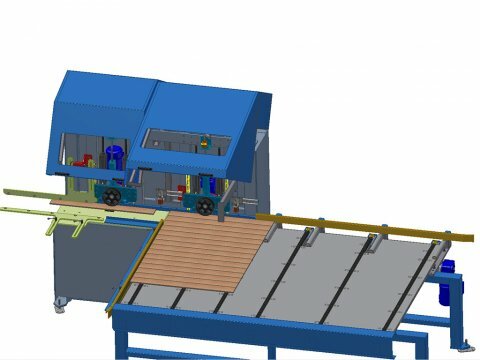 In principle, the device consists of two conveyor units, on which the servicing personnel arranges elements and the feeding device. Thanks to this combination of devices, lateral movement of elements is converted into the longitudinal movement. The feeding device was equipped with two transporting units with infinitely adjustable speed. Each unit has two independently driven wheels. Upper wheels are pressed against the elements transported with pneumatic actuators so provides the possibility to adjust the force of pressure against. Such solution provides smooth operation.